My husband and I have always been fans of the brain bucket. 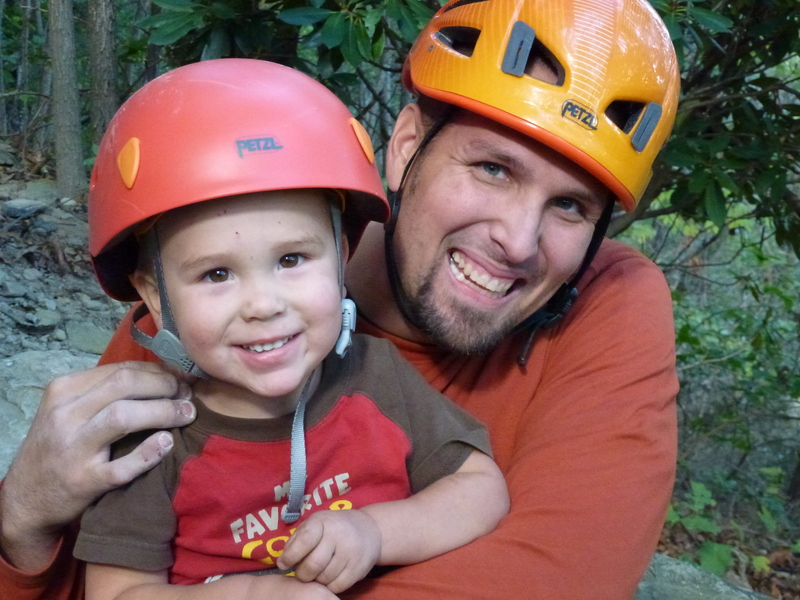 Climbing, biking, horseback riding, driving down I-77 during rush hour (one of these might be an exaggeration)…when it comes to adventures in the outdoors, many of our family photos involve a collage of hard hats. In the climbing world, this sometimes makes us seem a little bit dorky – while there are some climbing situations where I don’t wear my helmet, 90% of the time I’ve got one on if I’m more than 15 feet off the ground (for a more detailed version of my helmet stance for climbing, check out here and here). For me the bottom line is that head trauma can have devastating and permanent consequences, and with so many risk factors outside of my control, wearing a helmet is a simple and easy way to buy a little bit of insurance. It’s kind of a…”no-brainer” (cue boos from the bad joke police…). With our strong stance on helmet usage, it’s no surprise that Cragbaby scored his first helmet as a Christmas present at 8 months old. It was a kid’s helmet made by Bell, and was designed specifically for cycling. (or in C’s case, hitching a ride in his Chariot behind Mommy and Daddy’s bike). C received a balance bike for his birthday when he turned 2 this past March, and from the beginning we made a hard and fast rule of “NO HELMET = NO BIKE.” This meant that sometimes C went through weeks at a time where he didn’t ride his bike because of the whining that ensued every time we brought out the helmet. 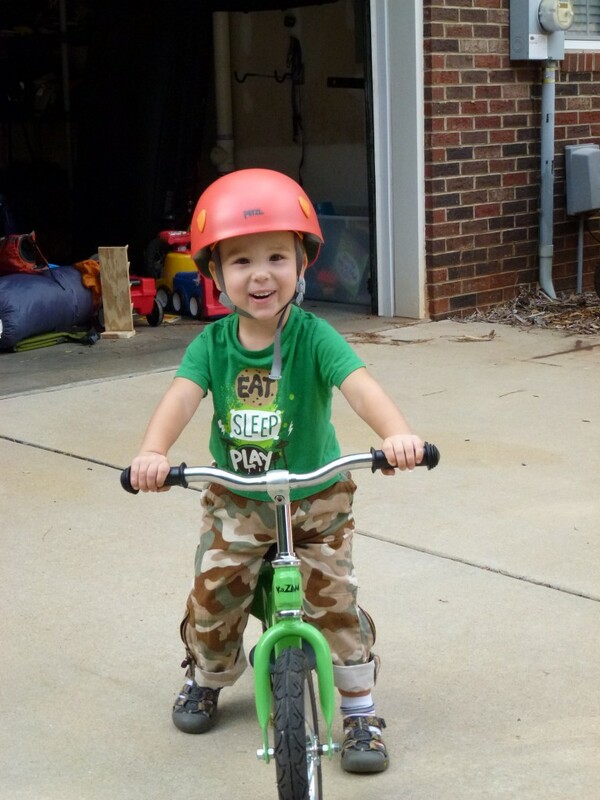 (And ironically sometimes he would put away his bike after 5 minutes, but then leave the helmet on for another hour…you just never know with toddlers, I guess). Anyway, we figure that the sooner he learns that helmets are synonymous with certain activities, the better. I don’t know about your family, but ours is into efficiency, especially when it comes to gear. It’s a great feeling to be able to cross multiple to-do’s off your list from purchasing just one item. 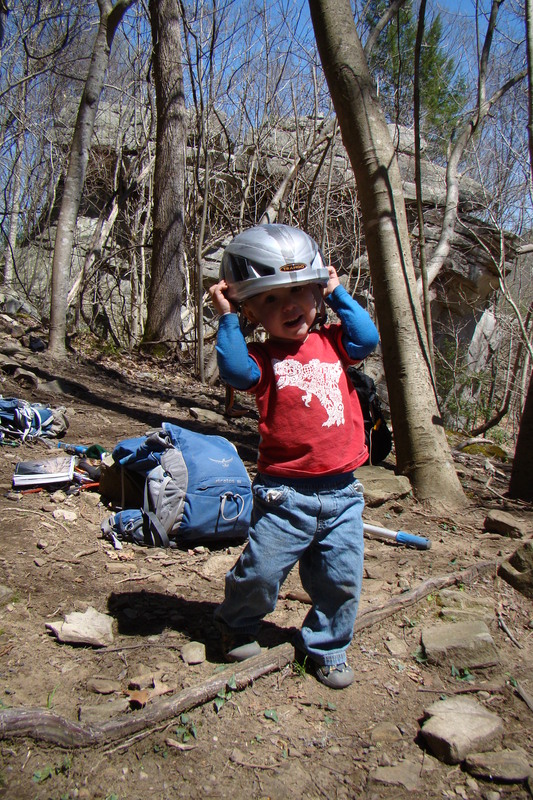 So when I saw the PICCHU helmet from Petzl, I knew it would be a good option for a multi-sport athlete like Cragbaby. 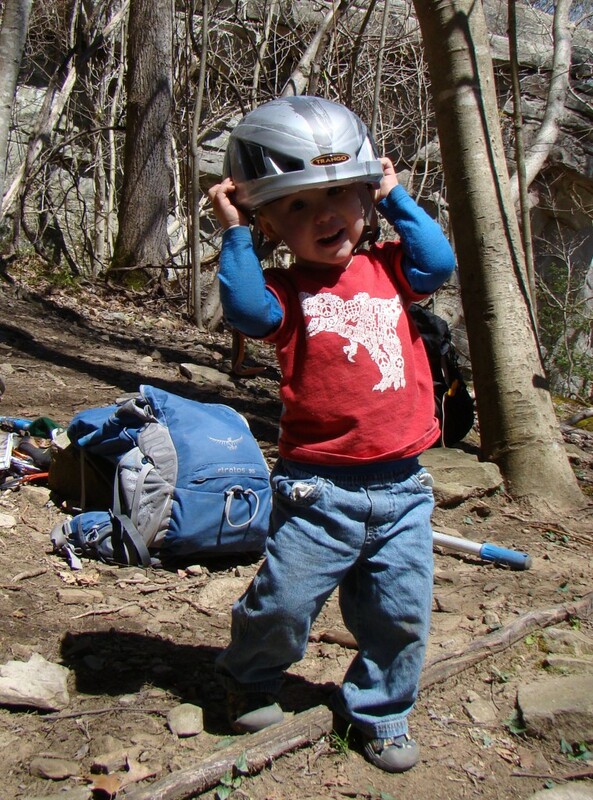 It’s one of the few climbing helmets on the market designed specifically for itty bitty noggins, and the only one that I could find that meets multiple safety standards for both climbing and cycling. It’s intended to fit children 3-8 years old (C isn’t quite 3 but it still fits him just fine), which means, in theory, this one helmet should last us through any adventure life throws our way for the next 5 years…now that’s what I call efficiency! When he first saw it, he was a little unsure, as it didn’t look at all like his old (broken) standby. “It’s scary, Mommy,” were his exact words. But once I showed him that it was “just like Daddy’s,” he demanded to put it on right away, and ever since then it’s been the first thing he grabs when he goes into the garage. Cragbaby likes the bright red color and the fact that it came with several pages of stickers to personalize his hard hat (although he’s chosen to put them on his sandbox cover instead…). I like the fact that it is easily adjustable for a wide range of head sizes and that it makes C look like a cute little toadstool. But my favorite thing about it is the fact that C likes to have it on. That tells me that it’s comfortable for him and doesn’t feel heavy or excessively hot on his head. But most importantly, that tells me that the messages we’re sending C about the importance of safety are being received loud and clear! What are everyone else’s thoughts on helmets? 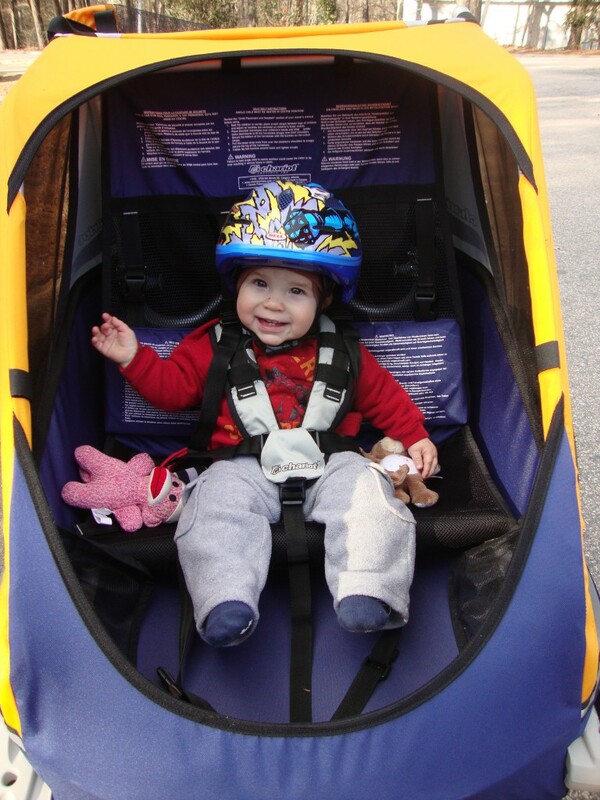 When, where, how, and why do you (or don’t you) use a helmet for yourself or your kiddo? C is getting so big!! We’re all about helmets. Skiing, biking, skateboarding. Tragically, a 38 year-old dad in our community recently died while skateboarding with his kids. He fell and hit his head. Yeah, we’re dorks, but a head injury just isn’t worth it. 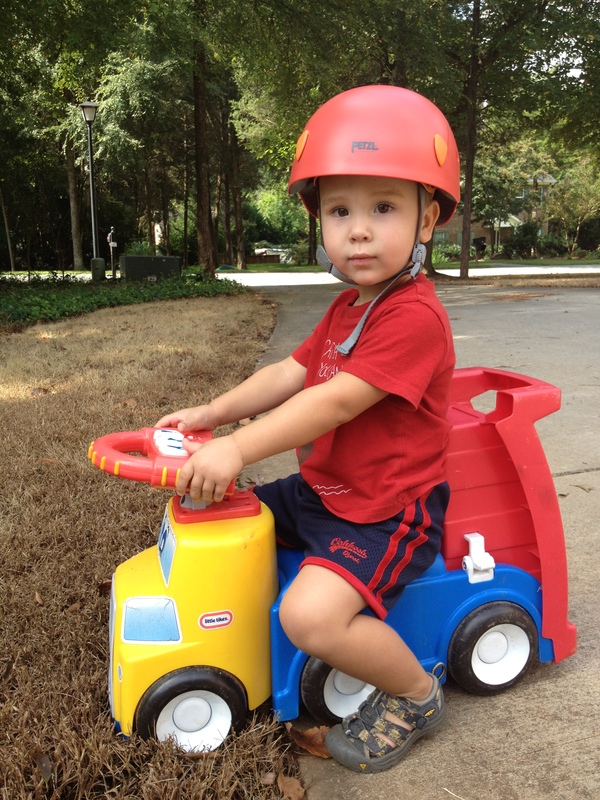 hi, my husband and I disagree about our 2 year old twins wearing helmets for outside play. We have a large wooden deck with several steps up to a smaller deck and the girls love to climb and practice walking up and down and have slipped a couple of times even when I was standing or sitting near them. We also have a full staircase with steep steps to the second floor of our house, and I am always nervous when I am helping them climb up since they refuse to let us carry them, so we take their hands and let them walk up. They are constantly bumping their heads every day and I mentioned helmets to him, but he insists that is ‘over the top’ and they should only wear helmets when they start riding bikes. Please advise, thanks! I think the decision to wear or not wear helmets like that is a personal one that each family needs to decide for themselves…since I don’t know your kids and their level of motor skill development, I’m pretty hesitant to advice. I will say that we never used helmets for anything just around the house, but that we taught our son (and will be teaching our 6 month old as well) to always wait for a spotter whenever he wants to attempt to climb anything, whether it be the changing table (a popular one!) or the stairs. This post might help? http://cragmama.com/2012/04/climbing-rules-and-regulations/ Best of luck to you, and thanks for commenting!